Sephardic Chief Rabbi, several MKs call to keep synagogue standing despite Supreme Court demolition order. Sephardic Chief Rabbi Yitzhak Yosef and MK Mickey Zohar (Likud) became the latest public figures to announce opposition to the demolition of a Givat Ze'ev synagogue on Tuesday, days before an October demolition date. "This place here is a place of Torah and keeps the Givat Ze'ev community safe; we must not allow the demolition of the synagogue, G-d forbid," Rabbi Yosef stated Tuesday morning. 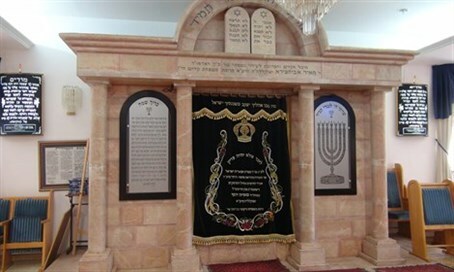 Rabbi Yosef added that destroying a synagogue is against halakha (Jewish law) and that measures to prevent its destruction must be taken by all means necessary. Zohar, meanwhile, declared that destroying synagogues is an anti-Semitic act. "These events we experienced throughout our years of exile, when our enemies were trying to hurt us and make us lose our Judaism by attacking our Jewish values and ideas," Zohair stated Tuesday morning. "This is what happened when we were in exile, when we were not under our own control and we did not have a country or sovereign power." "But today, in Israel, such a thing is unthinkable to happen," he continued. "I say this together with my colleagues, MK Bezalel Smotrich (Jewish Home), MK Moti Yogev (Jewish Home), and MK David Amsalem (Likud), who are very actively working on this - we will work together with G-d's help to prevent this disaster." The Ayelet HaShachar synagogue, which has been in use for over 20 years, was slated to be demolished after a far-left group filed a petition with the Court, claiming that the structure had been build on privately-owned Palestinian Arab land. The petition had been working its way through the courts for at least three years. Members of the congregation have offered the land's alleged owners a high price for the purchase or rental of the land, but they, and their lawyers, have insisted that the synagogue be torn down. Supreme Court President Justice Miriam Naor rejected appeals against the demolition, but did postpone the move until after the Sukkot holiday; the building is slated to be torn down next Thursday, October 15.